Learn how to tap dance with the following free mini-video course for beginners. The following 3 videos cover 5 of the most used beginner Tap dance steps in Tap dancing today. They are taken directly from the The Complete Tap dance course for beginners. Watch them in order and try them at home. These online Tap dance lessons are full of exercises and lots of angles to make sure you can get everything from home. In this first dance lesson you will learn how to Tap dance with the most fundamental parts of the Tap dance shoe – the toes and the heels. It’s exactly how it sounds, the toe is the front part of the foot and you would only tap with it when doing “toes”. The “heel” is the back part of foot and you’d press your heel onto the floor using only that part of the foot. These 2 basic tap steps are very important to get before moving to the other videos below. Learn 37 different Tap steps and 14 combinations with HD videos (Over 12 hours). Everything is broken down step by step and it even includes practice sessions to music. You can watch the lessons online or download them to your computer. Here is a great lesson showing the difference between the Stamp and Stomp steps. These two Tap moves are very popular and are present in many combinations. The stamp is where you pick up your foot and press it into the floor and then changing your weight immediately. The stomp however is when you press you foot into the floor but without changing the weight. These 2 basic tap dance steps are very similar but you must understand how they differ. 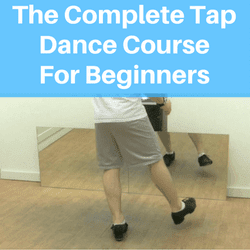 Get The Complete Tap dance course for beginners and learn 37 Tap steps. In this last lesson you will learn the brush Tap dance step. This is a more difficult step that requires more technique so don’t worry if you don’t get it right away. You want to lift off your foot and swing it from the back to the front making one single touch with the toe part of the tap shoe. As shown in the video, you don’t want to sweep the floor in this move, but only make a single tapping point as you brush your foot. This move will help you develop better balance as you must really stay on one foot for a long period of time. 1. Buy Tap dance shoes – If you are serious about learning how to Tap dance you need to get the proper shoes. It will speed up your learning progress and give you the real feeling right away. 2. Master the Rhythm of your moves – Tap dancing is one of the most rhythmical styles of dance so you need to make sure you hone down the timing of every single move you are learning. Without timing, your technique won’t improve. 3. Find fluidity in your ankles – The key is to make dancing look fun and easy. Therefore, it is important that you don’t keep your ankles and knees locked up. You need to relax them and let them be free in order to tap dance. 4. Practice often – Tap dance steps require lots of balancing and coordination. It is not the type of dance style you can pick up in a few hours. Instead schedule regular practice to go over your moves if you want to be really good. We hope you enjoyed this free beginner series on how to tap dance. Please leave a comment below if you liked these videos. 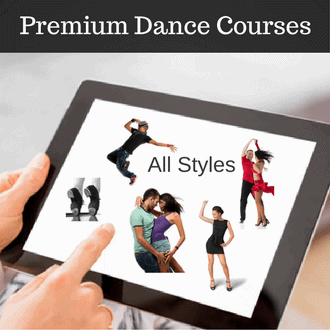 To learn other dance styles visit our online dance lessons page.